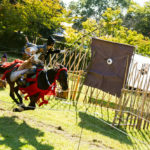 As Western holidays become ever more popular in Japan, so too increases the merchandise geared toward such holidays. 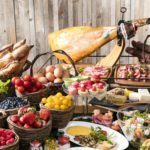 But even though Christmas trees and ornaments, Santa Claus figurines and snow globes are everywhere this time of year, there still is nothing even close to the variety of options one would find in Europe or North America. So for that reason, sometimes it's best to just make your own. We at Savvy love 100 yen shops, and they are particularly good places to buy craft supplies. So when I couldn’t find the type of wreath I wanted to buy, I headed over to the mammoth Daiso on Takeshita-dori in Harajuku to see what treasures I could dig up. 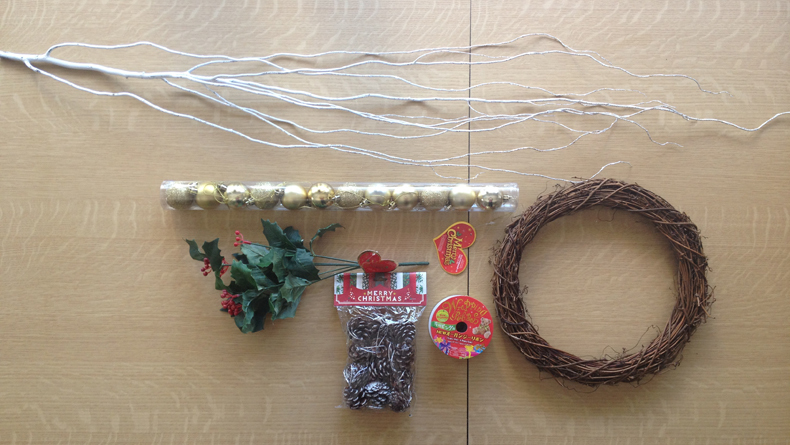 From the 100 yen shop, I bought round gold Christmas ornaments, a bouquet of fake holly, a spool of ribbon, and some pine cone ornaments (five packages in varying sizes). I picked up an undecorated wreath base (¥530) and a long white painted branch (¥350) from a local flower shop. 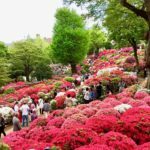 In addition, you’ll need a hot glue gun and extra glue sticks (incidentally, both are also available at the 100 yen shop), as well as gardening shears or a heavy duty pair of scissors. Use the gardening shears to cut the thin, white painted branches from the thicker main branch. 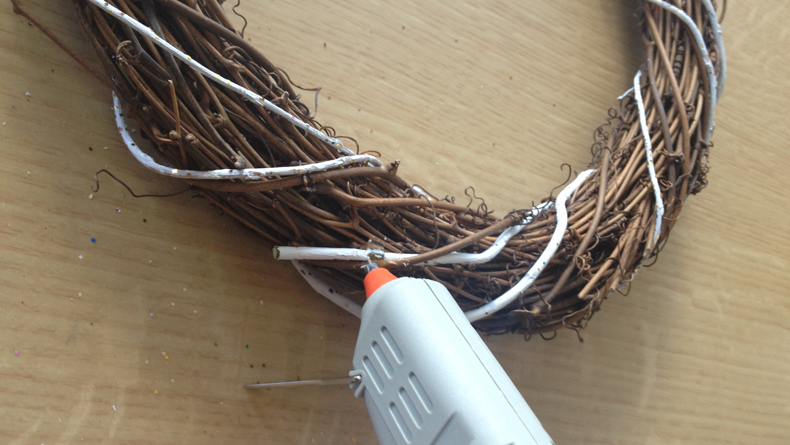 Then, tuck the thick end of one of the smaller branches in between some of the twigs at the back of the wreath base, and secure it with hot glue. 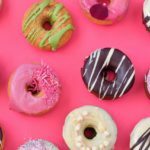 Once it has dried, wrap it around the wreath in a spiral motion, and then secure the other end with a bit of glue as well. Repeat this process until you have used all of the thin, white painted branches. The next step is to attach the pine cones. Since the ones sold at the 100 yen shop are ornaments, they have a loop of string attached to the top that you’ll need to cut or pull off before attaching them to the wreath. 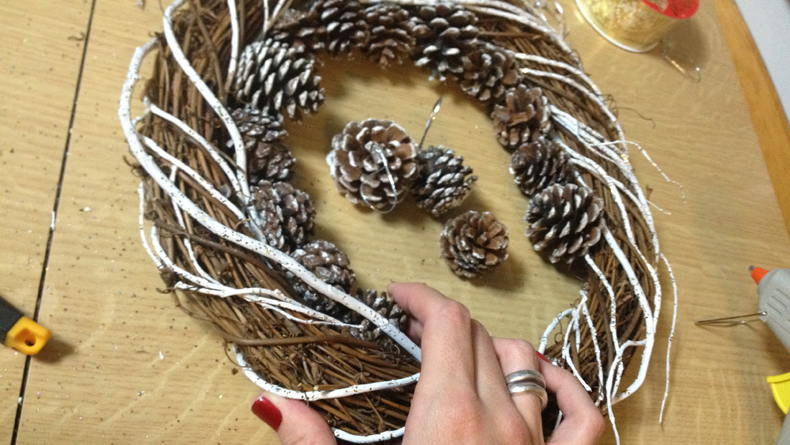 Using hot glue, first attach a row of pine cones to the inner edge of the wreath base. I alternated different sizes of pine cones and attached them at slightly varying angles to give it a random, less “perfect” look. 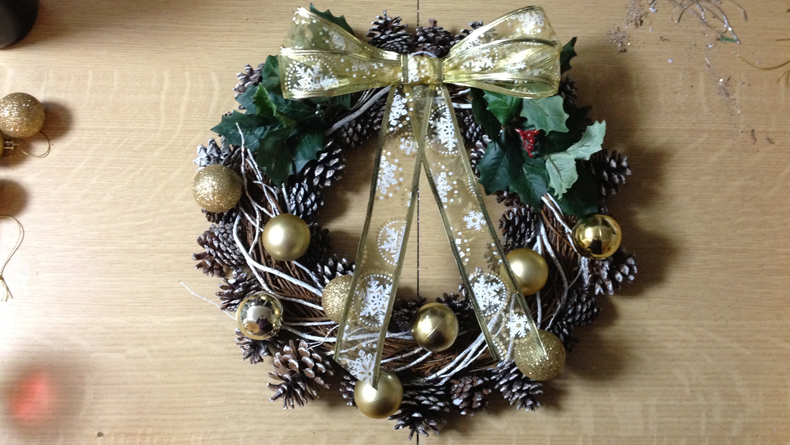 Repeat the same process for the outside of the wreath until it looks like the photo above. I used a total of five packages of pine cone ornaments for this (two large, one medium, two small). Next, cut the individual sprigs of holly from the bouquet. I also cut off the berries, because the ones from the 100 yen shop are very cheap looking (I did leave just one bunch of berries that didn’t look as bad as the others, and it gave a nice little bit of color to the finished wreath). Tuck the holly stems into the wreath just to either side of the top. I used two stems on one side and three on the other for a slightly asymmetric look. You can secure the stems with hot glue if desired, but it didn’t seem necessary to me. Tie a bow with your ribbon. I used translucent gold and white ribbon with wire edges and made a double bow. I left the ends fairly long. 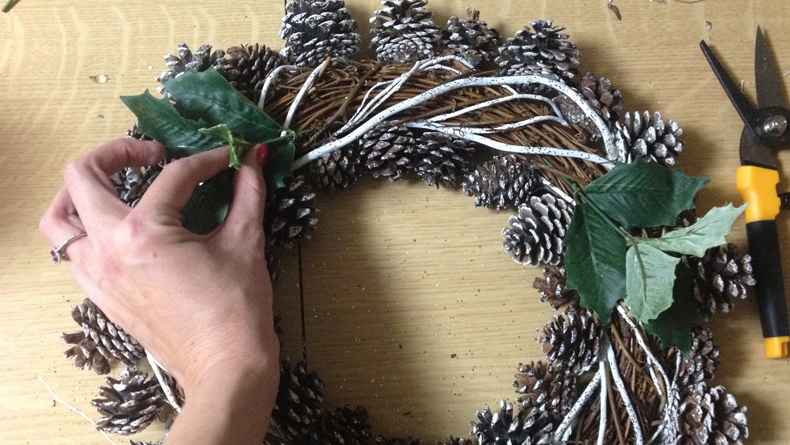 Once you’re satisfied with your bow, glue it to the center top of the wreath in between the sprigs of holly. 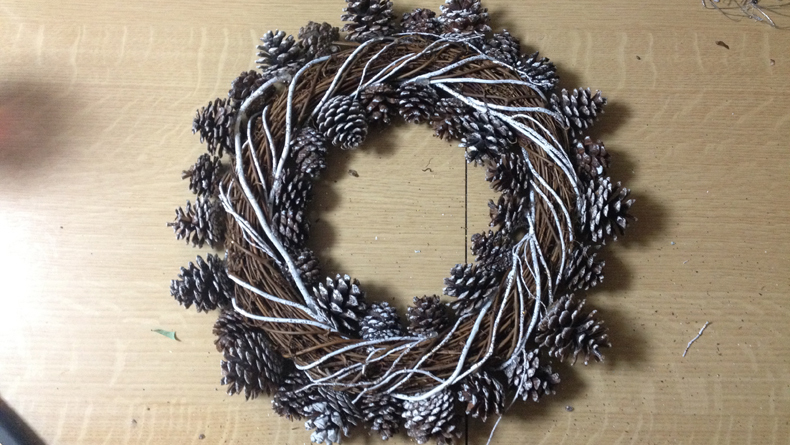 Finally, arrange the round ornaments around the rest of the wreath and secure them in place with hot glue (cut off the strings first), with the top of the ornaments facing into the twigs of the wreath. The thing I like about the 100 yen shop ornaments is they come in a package that is all the same color, but with three different finishes (shiny, matte and glitter), which give some nice variety. 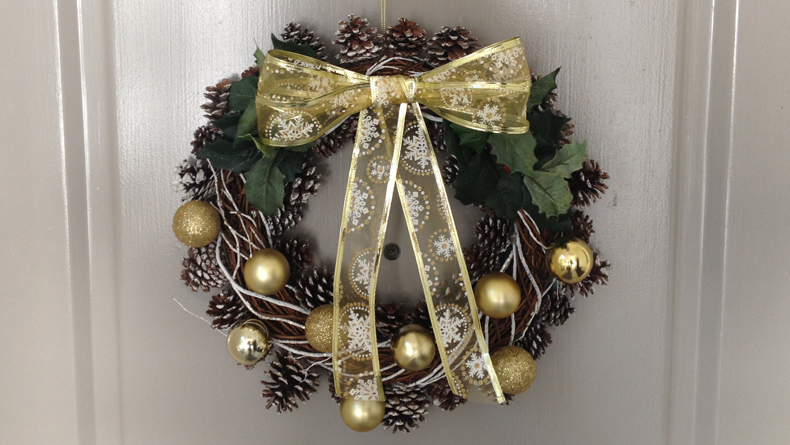 If your wreath base didn’t come with a hanger attached (mine didn’t), loop a piece of wire or string through a few twigs at the top back of the wreath and tie securely (I used one of the strings I had removed from the ornaments). Voilà! Hang and enjoy.